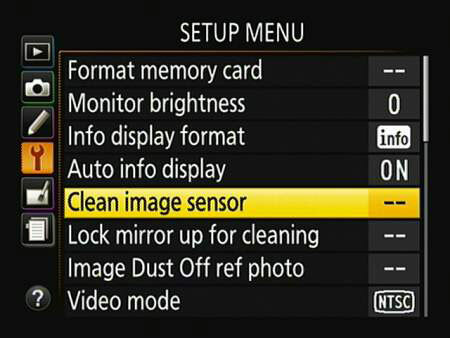 Clean Image Sensor: Through this option, you control the camera’s automated, internal sensor-cleaning mechanism. By default, this automatic cleaning happens every time you turn the camera on or off. But you can adjust this behavior or request an immediate cleaning session via the Clean Image Sensor option, featured in this figure. Use the Clean Image Sensor option to set up automated cleaning of the sensor or start the cleaning mechanism at any time. Lock Mirror Up for Cleaning: If you frequently change lenses in a dirty environment, the internal cleaning mechanism may not be adequate, in which case a manual sensor cleaning is necessary. You can do this job yourself, but it’s not recommended. Image sensors are pretty delicate, and you can easily damage them or other parts of your camera if you don’t know what you’re doing. Instead, find a local camera store that offers this service. Sensor cleaning typically costs from $35–$75, depending on the level of cleaning that’s required. Whether you do the job yourself or have the cleaning done for you, choosing the Lock Mirror Up for Cleaning option, also found on the Setup menu, is the first step in the process. Choosing the command moves the camera’s mirror out of the way so that you or the camera tech can access the sensor. Make sure that your battery is fully charged before taking this step; otherwise, the menu option is dimmed. Image Dust Off Ref Photo: This Setup menu feature is tied to an automated dust-removal filter found in Nikon Capture NX 2, an advanced photo editor available for purchase from Nikon. After enabling the feature on the camera, you take a picture of a piece of white paper and then tell the software to use that image as a reference to the dirty areas of the sensor. (Areas that show up as specks on the white background are classified as dust.) With that information, the software knows where to apply its dust removal filter in your other images. This feature works only with Raw (NEF) photos and isn’t a cure-all — it may not always remove dust successfully. Rather, it’s designed as a partial remedy until you get your camera cleaned. If you’re interested, you can download a 30-day trial from the Nikon website.